Can you shortly explain your choice of the subject? I have a strong fascination for industrial sites and I wanted firstly to investigate the reasons of this personal aesthetic attraction and secondly find a way to make use of them as a landscape architect. A Brazilian friend of mine proposed me the opportunity to set my investigation in the Quadrilatero Ferrifero, one of the richest mining areas of the world. In this territory, the mining activity has strong cultural roots and its implementation rises many issues currently under debate, like the accident occurred in November 2015 close to the city of Mariana, considered the worst environmental disaster of the history of Brazil. I had the chance to take as a case study a damaged iron-ore mining site, a tailings dam in its decommissioning phase. My study helped me to understand how the scenic aesthetics of dissonances, characteristic of the mining sites, can play a key role in feeding the sustainability discourse through reclamation of these landscapes. Briefly, what are your source of inspiration? For this project my sources of inspiration have been multiples, but certainly two of them led me more strongly. First, the colours, the forms and the richness of the Brazilian nature (together with its culture) struck me since my first days in this country and led me till the final design phase where I tried to report it. I took the atmosphere of “The Dream” by Rousseau as a reference image of what I wanted to represent. Then my second main inspiration has been the “Inferno” of the Divine Comedy by Dante Alighieri. The author makes use of harsh and terrific images to convey a positive moral message to its readers. Similarly, I intended to communicate, by showcasing dissonances, wonder and interest towards the acknowledgement by the visitors of the ecological issues related with mining activities. As a landscape project I have been much inspired by the art exposition park of Inhotim by Roberto Burle Marx. A key moment has been when I started the collaboration with Jolanda de Jong who made her dynamic model by using as reference a part of my project. Interacting with her helped me to leave my designer “shell” and to better reflect upon my ideas. But throughout the entire process I found it extremely important to take nice lunch poses with friends to refresh my mind and to relax. The technological developments of the last hundred years have left us with many abandoned industrial landscapes that constitute a threat to the local environment. These include post-mining landscapes, which are expected to grow in number worldwide in the coming decades. 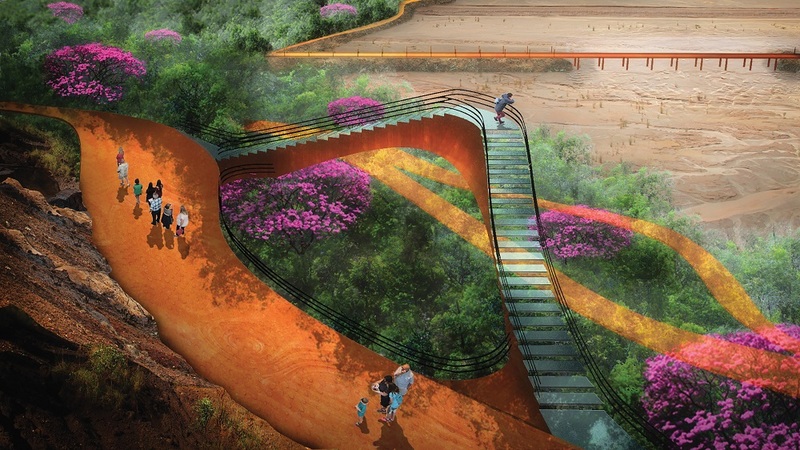 Reclamation, as defined in the literature by Alan Berger (Professor of Landscape Architecture and Urban Design at MIT), has the ability to recover these landscapes as a laboratory for new scripts, minimizing their negative impacts and maximizing their aesthetic and ecological functionality. Section A-A’: Some general guidelines have been distilled from the design of the Post-Mining Wonder. 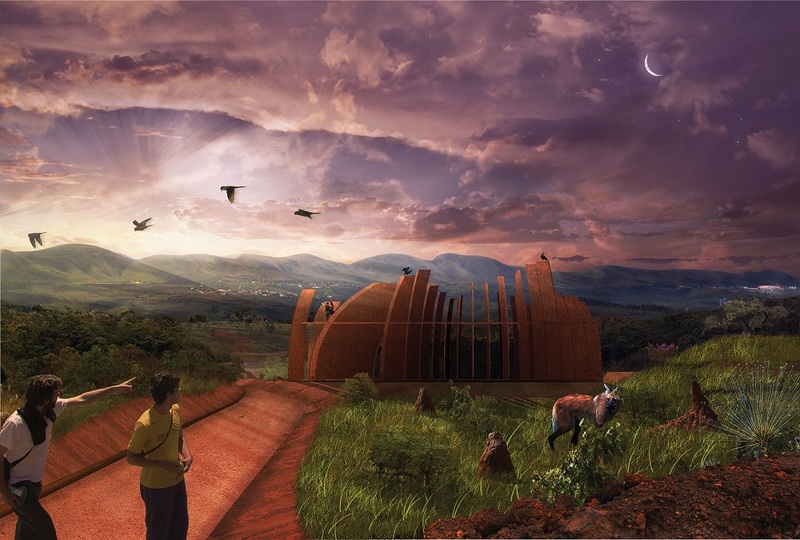 Three are aligned with ecological values, fostering environmental knowledge and appreciation of the surroundings, while the other four are not necessarily aligned to the promotion of deeper ethical reflections on the relationship between humans and nature. Berger denounces the inability of landscape designers to look at these landscapes purely from a technical and economic perspective. Again, many experts in different fields of knowledge have addressed the issue of how to integrate the aesthetic experience beyond the traditional connotations of beauty adhered to in the sustainability discourse. Although there are many good examples these days of reclamation projects, there is almost no literature about the way the scenic aesthetic component relates to ecological values. This holds especially for such controversial places as post-mining landscapes. The pavilion: this structure stands high up in the landscape at the former site of a tailings pile. Its purpose is to recall the pile and the views to be had from it but it can also host exhibitions and itself give a panoramic view of the area and its surroundings. 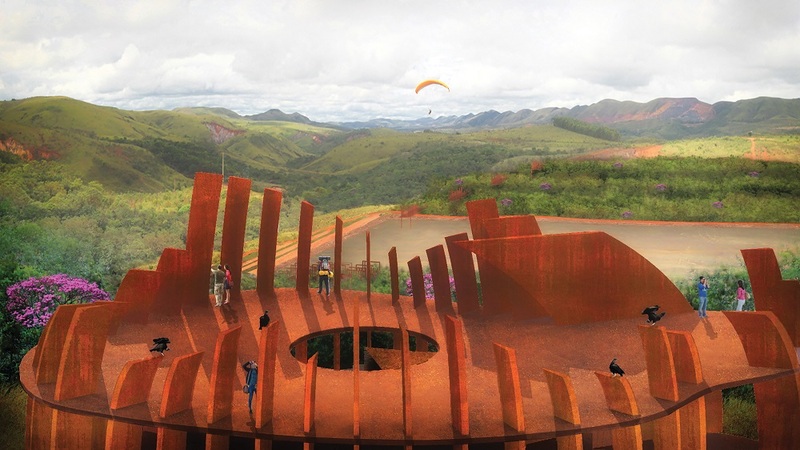 In my thesis, I have investigated this phenomenon with a design project for the Quadrilatero Ferrifero in Minas Gerais, Brazil. To understand how reclamation can be achieved, I conducted qualitative research in which the scenic aesthetic and the ecological components were analysed separately. 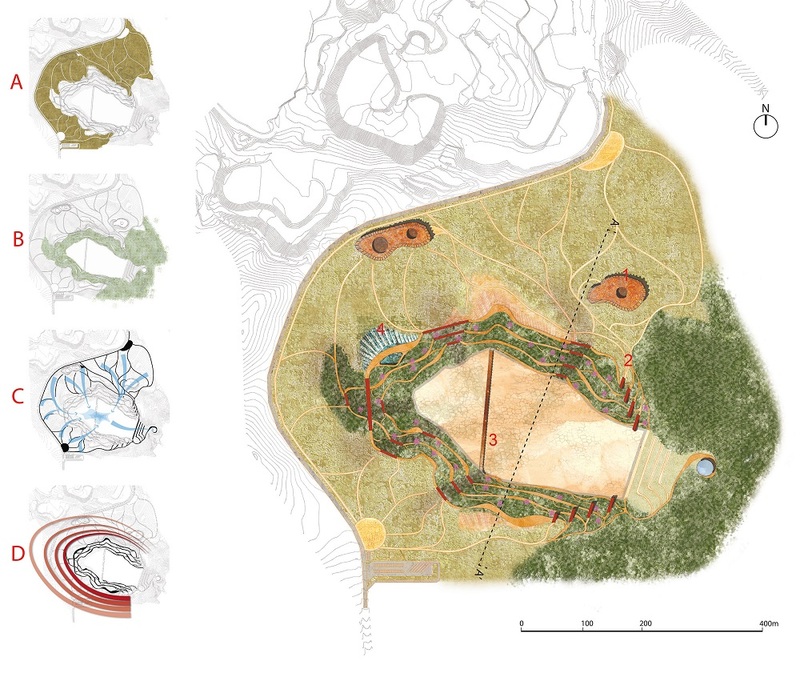 Then I used my design capacities to combine these two apparently divergent perspectives for this site, drawing up a number of guidelines that could be applied to other such post-mining reclamation projects. The accident site: this area is to be studied and shown from different viewpoints, close by and far off. It is also intended to convey the feeling of instability so typical of the site. I’m in Italy, in my home town, collaborating with “pool landscape”, a small and brand new landscape studio where I have the chance to deal with new challenges such as promoting landscape architecture in an area of Europe where it is almost unknown. Furthermore I’m struggling to get my study title recognized here in Italy and to formally enter the profession of Italian landscape architects. What kind of hopes\achievement would you like to reach in the near future? I wish to continue doing something in which I believe, and something that I know will make people’s life better. 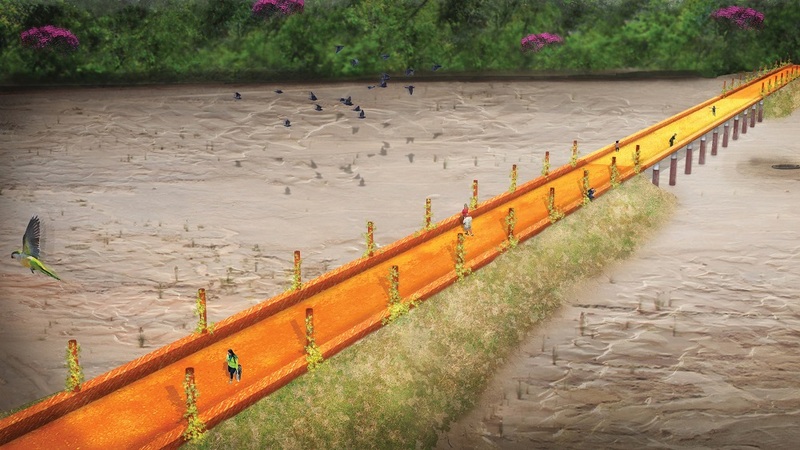 The motto of my thesis is: “The world will never starve for want of wonders, but only for want of wonder”, for me one of the main purposes role of the landscape architect is to disclose everybody’s wonder toward the world that surrounds us, and therefore to care more for it. 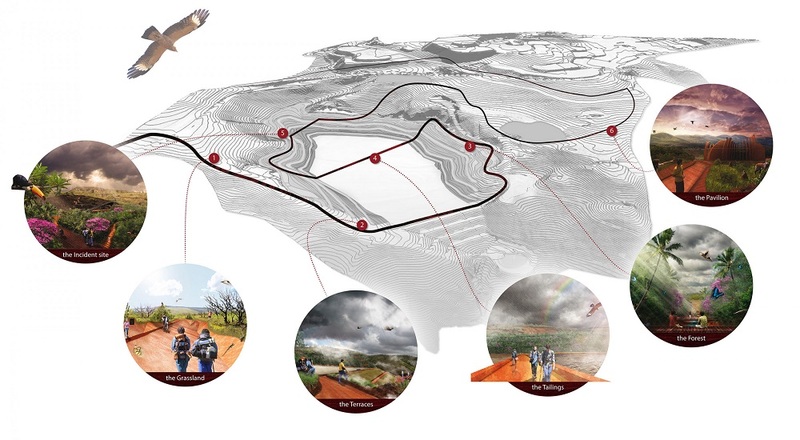 The post-mining experience path: the newly created landscape is the result of combining the research outcomes. Each part of the landscape evokes a different experience and has its own logic. In addition, the scenic aesthetic component of the mining site is deployed in various interventions in the area’s redevelopment. The terraces: these structures are located where the dam’s stairs used to be, as a reminder that that function has been made redundant. 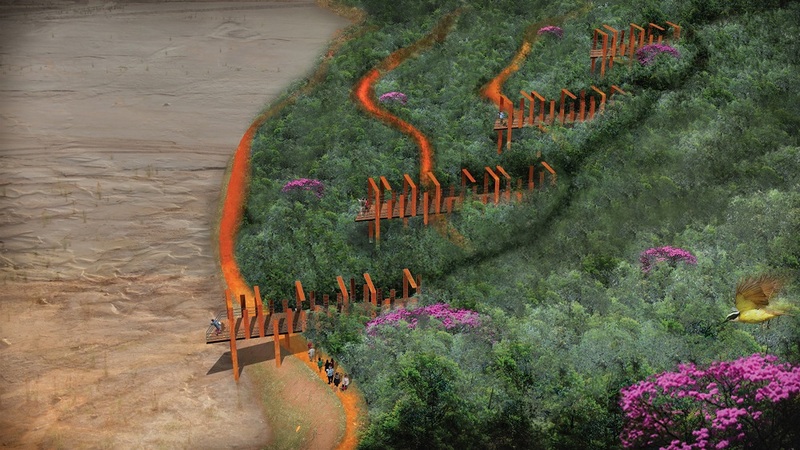 The tailings path: this path offers the experience of a walk above the tailings (an area generally kept closed to the public) and gives a powerful impression of the dramatic scale.